Last weekend I had the privilege of co-hostessing a baby shower for a friend. 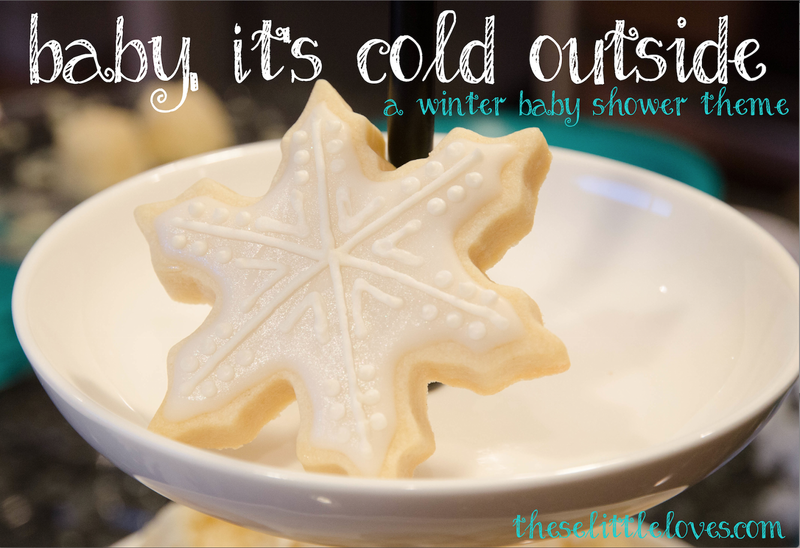 I got excited because I had never intentionally thrown a winter shower before (one had to be delayed to winter because the mom had the baby on the original date). Not to mention, the ladies invited were super awesome and it was pretty much guaranteed to be a good time. I started brainstorming a few months ago. 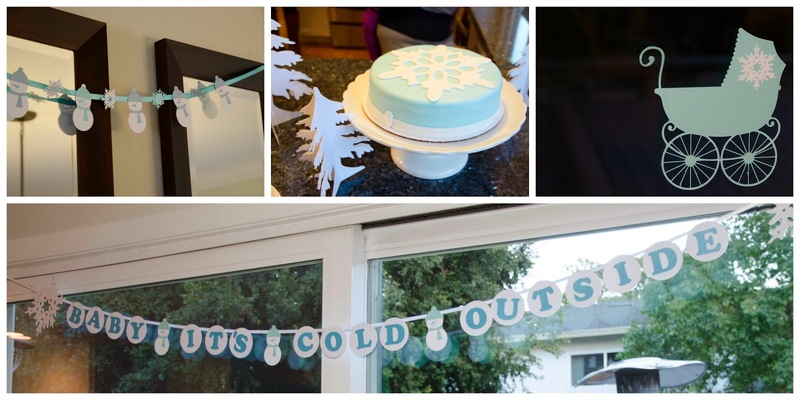 After some deliberation, I settled on a "Baby, It's Cold Outside" winter theme in icy colors like pearly white, teal, and light blue. It was gender neutral and there were so many possibilities for adorable decorations. I couldn't break the bank with the shower costs (especially with all the Christmas gift buying this season holds) so I decided to see what I could put together myself. I started by making the invitations. I think they turned out pretty adorable. The design uses two free fonts: pea ellie bellie and DH snowflake. I printed them at home on card stock. 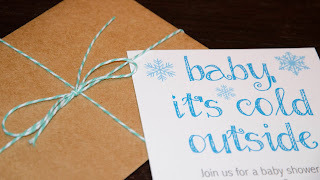 Then I placed each one in a kraft paper envelope, sealed it with teal and silver washi tape, and tied it up with teal baker's twine...which turned out to be a hint at the main activity for the shower. I love baby showers, but so often the progression of the shower is awkward or the games a little less than fun. We decided to throw the normal games out the window and make this an activity only shower. By which I mean all the guests participate in an activity or craft together. 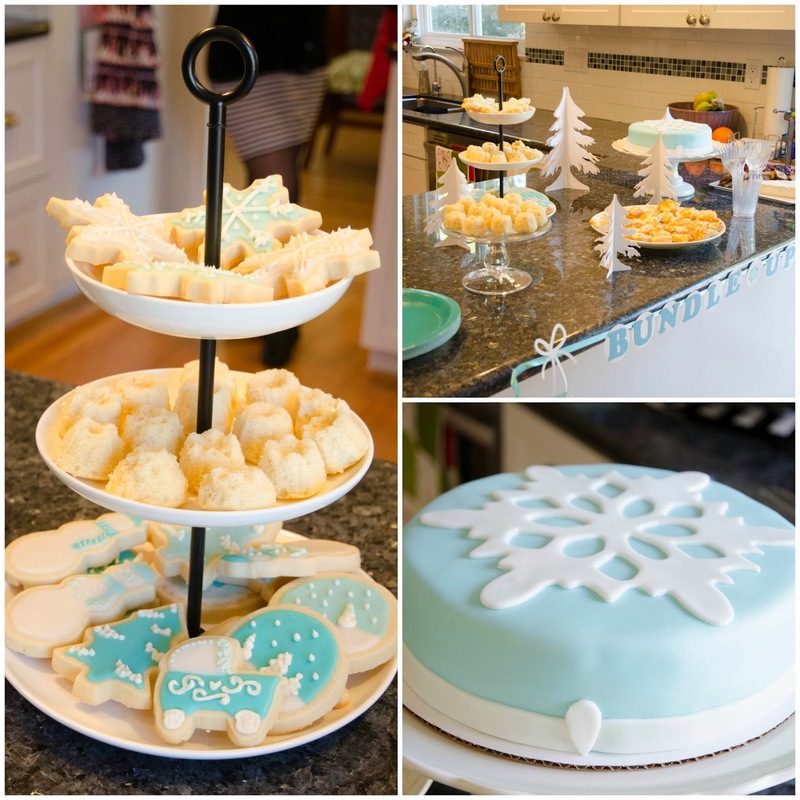 For example, the mom-to-be for this shower enjoys baking so we set up sugar cookie decorating for all the guests. It turned out to be a lot of fun and allowed the conversations to continue while decorating. The other benefit here is that the guests took their cookies home as the party favor. Two birds with one stone. 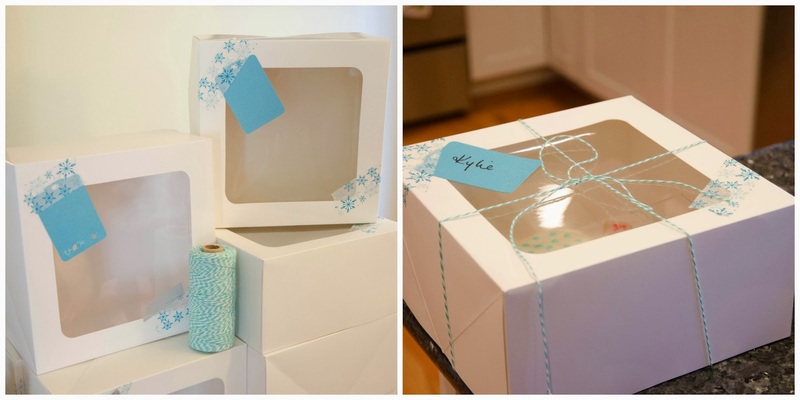 We decorated little bakery boxes with washi tape, thank you tags, and tied them up with the baker's twine. A sweet little package to take home and enjoy later (and perhaps reward the babysitting husband). And now to my favorite part...the decorations. I really put my Silhouette Cameo to work! I started with shimmery card stock paper in white, teal, and blue and ended up with snowflakes, snowmen, mittens, snowflake prams, snowy 3D trees, and a couple snowball garlands. The garlands read "Baby, It's Cold Outside" and "Bundle Up Baby". Snowflakes were taped to windows, snowmen strung on a garland, the snowy 3D trees were scattered around the tables and the food. For the cookie decorating tables, I used a roll of brown kraft paper (the kind intended to wrap packages in for mailing) to create table runners. Using white shimmer craft paint, I hand painted snowflakes along the length of it. Then at each person's seat there was a wax paper placemat held down with washi tape. After the decorating you literally just roll the whole thing up and toss it. The desserts were also designed to match the theme (like I said, I really got into it). I decorated a Mexican chocolate cake with teal fondant and a huge white fondant snowflake on the top. I used the giant snowflake cookie cutters from Williams Sonoma. Then I dusted the whole cake with Wilton Pearl Dust in White to make it sparkle. Then I made tiny glazed vanilla tea cakes and decorated a few of the sugar cookies, of course. To round it out we had some amazing cheese/carmelized onion tarts, rosemary raisin crisps, and spiced cider all from Trader Joe's (and mulled wine for the non pregos). We wrapped up the shower with cake and gift opening and called it a day. And, yes. I did give her a bunny ear teether :). A time saving tip for the mom-to-be: have each guest write their name and address on a welcome sheet. Then use that sheet to document the gifts given. That way the mom-to-be has all the information for the thank you notes in one place. If you design the invitations, you can just use the same fonts to make a matching welcome sheet.